Happy Tuesday, y'all! Is it just me or is the day after springing forward the toughest?! My body is so confused and I'm just so tired. I even took a nap on Sunday afternoon to try to get my hour back but it just didn't help. My kids and I were seriously on the struggle bus trying to get ready yesterday morning. But the upside to springing forward is that spring is on the way and that makes me so happy! I am all about spring style right now but the weather isn't quite cooperating. We have had spring temperatures randomly here and there over the month but right now it's been cold. 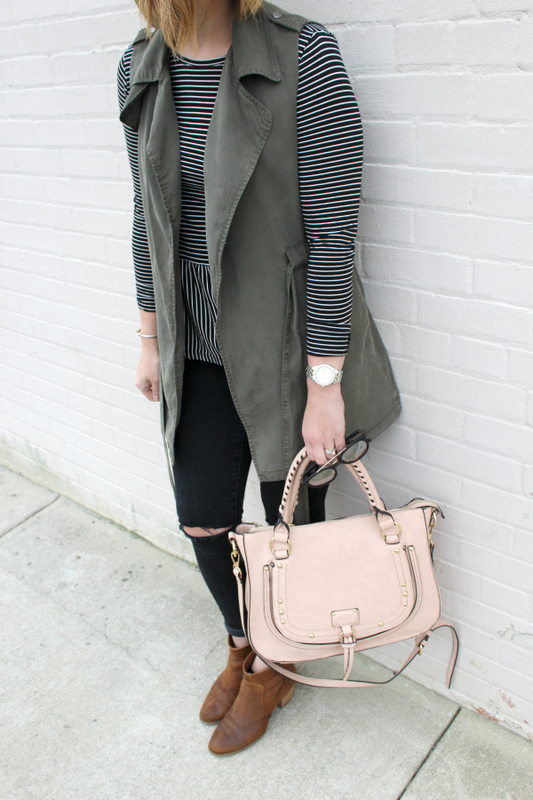 I'm eager to put my spring pieces to work so I'm all about spring layers right now. 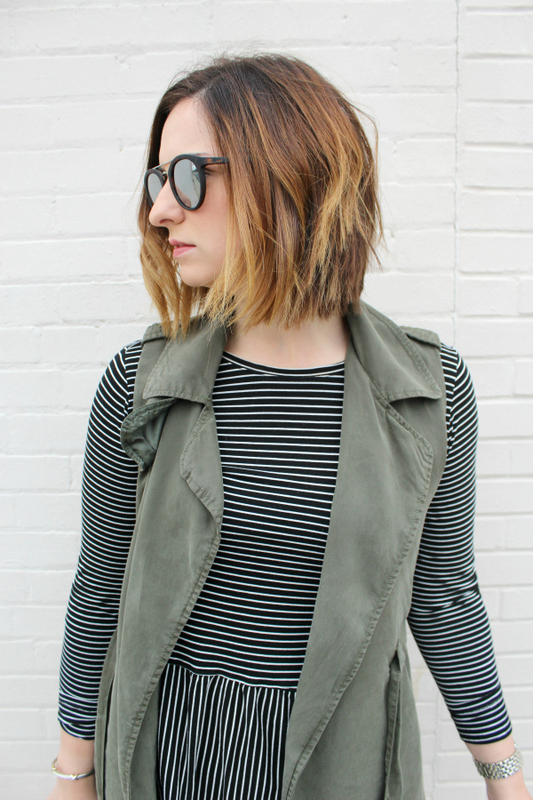 One of my favorite layers for spring is a utility vest. It's such a versatile piece! I found mine at Marshalls but I've linked a similar one that I also love at the bottom of this post. 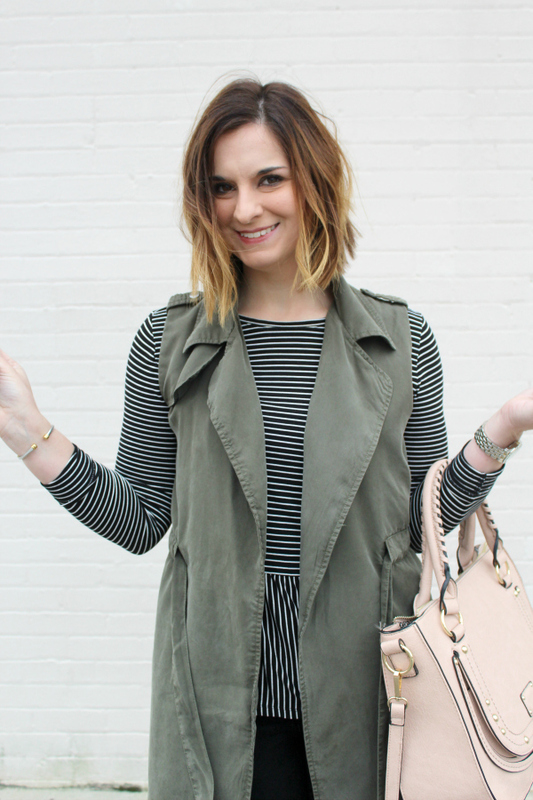 I layered up with a striped peplum tee, distressed black denim, ankle boots, and my favorite bag for spring. 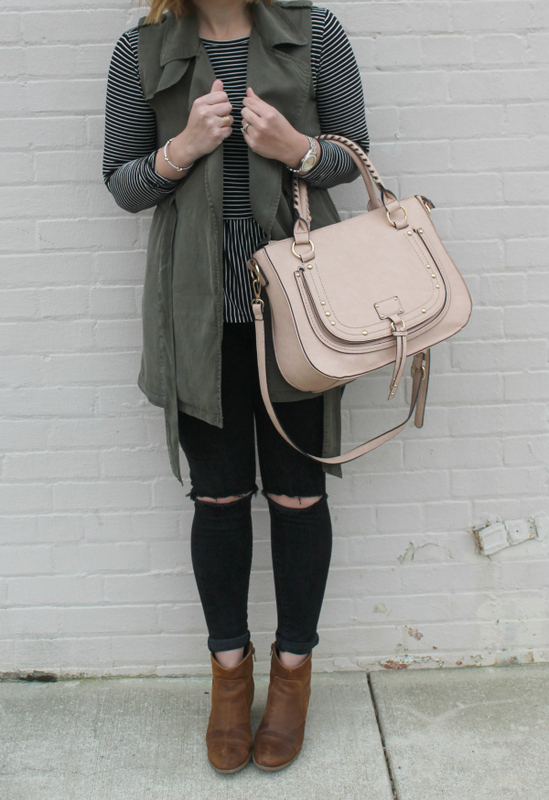 Adding a blush bag to a neutral outfit instantly makes the look more springtime friendly. 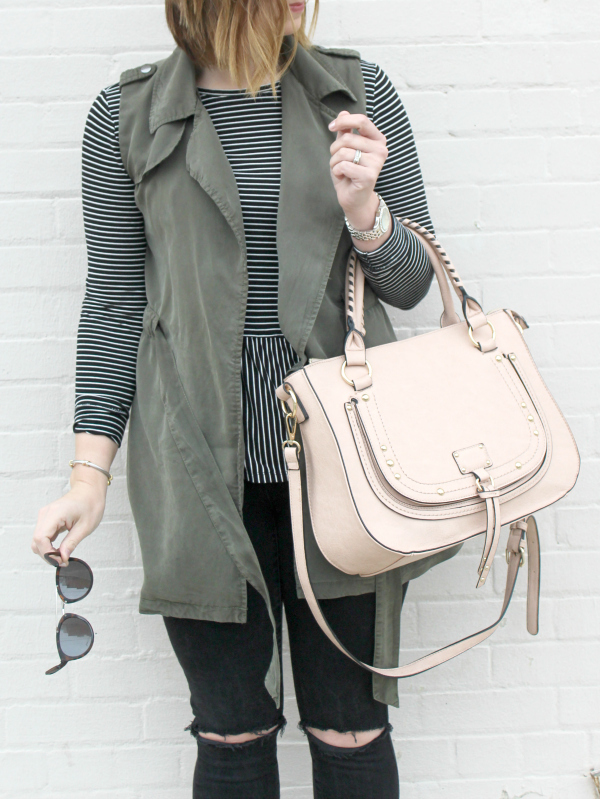 I'll be styling another one of my favorite spring layers here on Thursday. A denim jacket! I hope you all have a wonderful day! 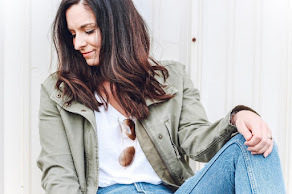 I am loving your spring pieces! I am so ready for the warmer weather too! It has been up and down here! Wow! Your hair color is so cool! Your bag is so cute, I love your vest too! 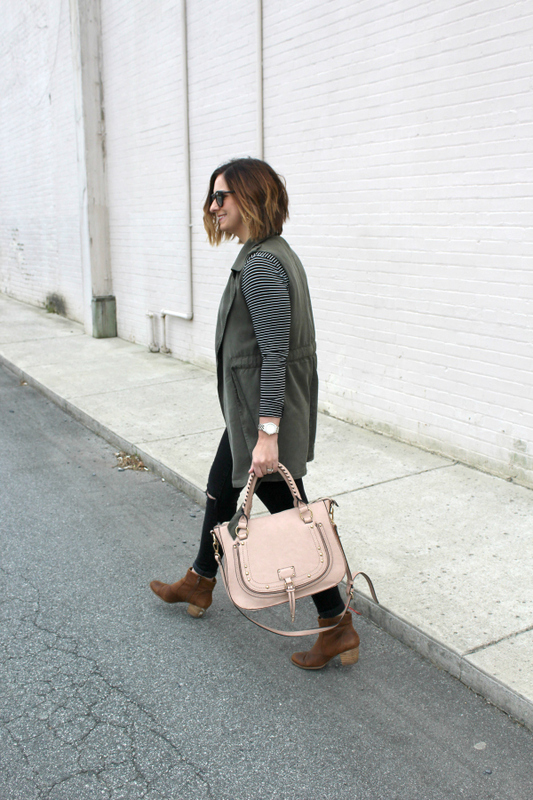 Love the vest and how you paired it! I can relate to what you're saying about the crazy weather. I live in Miami and temperatures drop from the 80's to the 60's in minutes. That utility vest is great, but I especially like that handbag! Daylight savings is such a struggle!! I've been having a hard time too. Love the peplum! I love how you paired a pastel accessory with the darker colors. Thanks for the inspo! 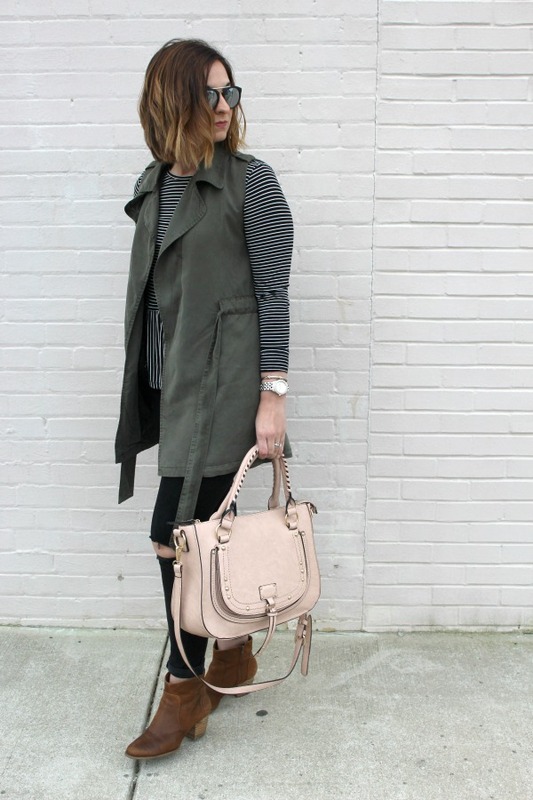 I am loving the layers and that bag! The color of that bag is so cute! 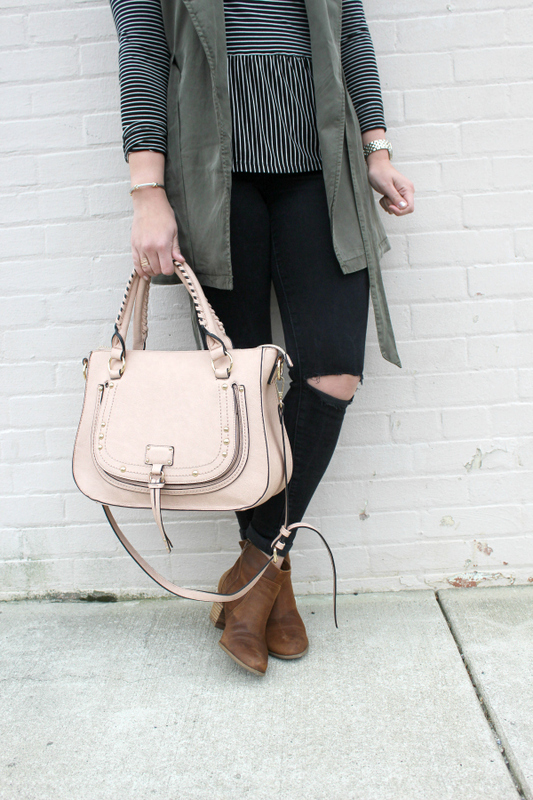 Perfect layering! Happy S P R I N G!! !